"Satisfying Stories set in the world of golf. What a treat!" "Sure, It's that little white ball that's the prime mover—but the surrounding universe has rules of its own. Trouble is, golf is about people—and Mr. Rechlin shows them, from eagles to bogies." "Do you have to know golf to enjoy these stories? No. These stories are truly more about humans and our desires than golf... . 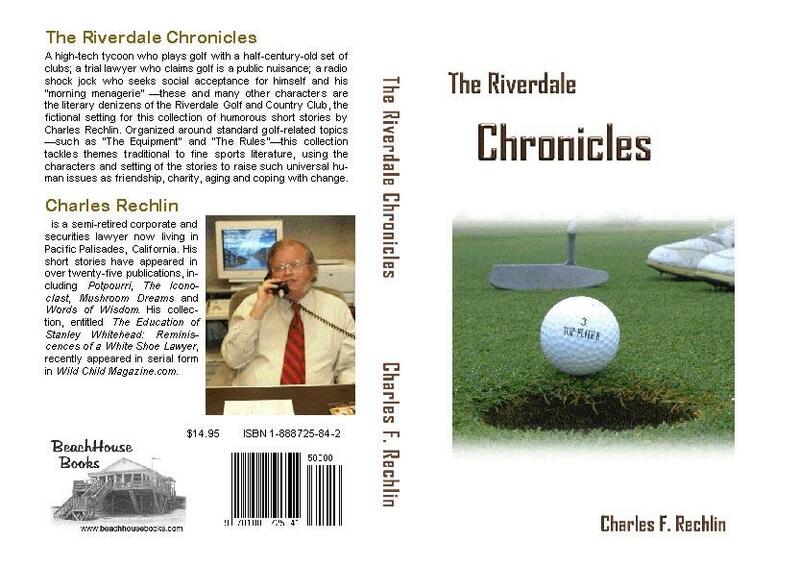 If you are looking for a book that will keep you chuckling, The Riverdale Chronicles is a must to have in your library." All winter long, Mother Nature held River Grove in a stranglehold. Sub-zero temperatures, blustery Northeast winds, record snowfall and gray, overcast skies battered the upscale suburban community relentlessly from December through February. And no one suffered more than the members of the Riverdale Golf and Country Club, whose lush links lay buried beneath a thick blanket of snow and ice. Patience wore thin, and tempers flared, among the Club’s winter-weary membership as what seemed to be a permanent Ice Age descended upon the city. It was, therefore, with a collective sigh of relief that, on the first day of spring, members—so long deprived of the fellowship of fairway and green—greeted a letter from the Club’s General Manager announcing April 7 as “Opening Day,” and inviting all men to participate in the Annual Partners Best Ball Classic. Bags were taken from storage, clubs cleaned and polished, shoes cleated and shined. Everyone looked forward to the season’s kickoff event—everyone, that is, except Arthur Edwards and Wally Greer, the reigning champions. The two students were discussing a falling out between their fathers over Arthur’s prized Toro snowblower . . . .
Would you rather use an order form and mail a check? Click here for an Order Form to print, fill out and mail. BeachHouse Books is an imprint of Science & Humanities Press. Author Guidelines are at Science & Humanities Press. If a book has a defect, or doesn't hold up under normal use, or you are just unhappy with it in any way, we are interested to know about it and will replace it and credit reasonable return shipping costs. Products with publisher defects (i.e., books with missing pages, etc.) may be returned at any time without authorization. We request that you specify the defect, to help us improve.